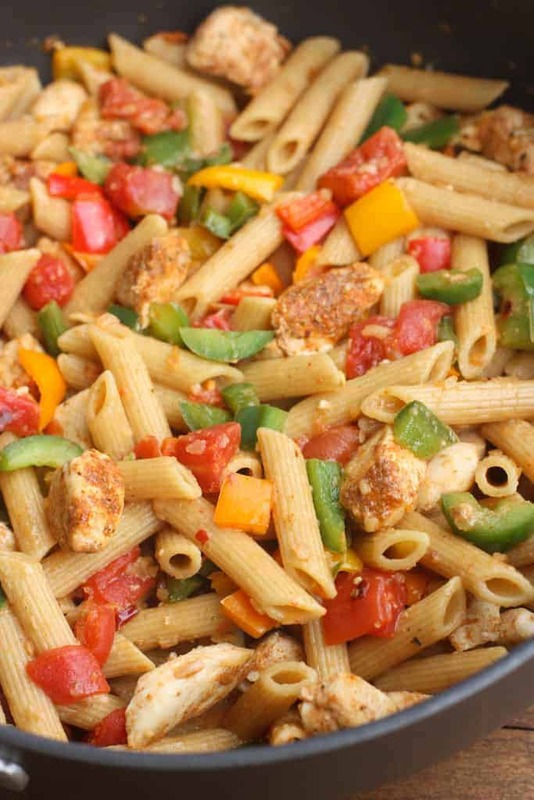 One Pan Chicken Fajita Pasta – everything you love about fajitas, transformed into a bold and delicious pasta dish! Happy Monday! 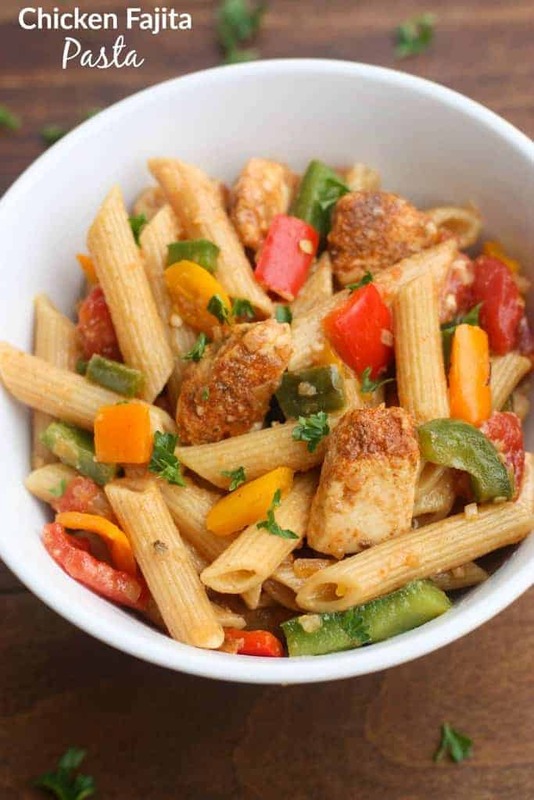 Who’s in need of some meal inspiration for the week?! We may or may not have made these Asian Turkey Lettuce Wraps three times in the past two weeks. I’ve also been a total sucker for these Tomato Avocado Melts for lunches and snacks. If it’s easy, healthy, and my kids will eat, I’m a happy camper! I’ve been in a comfort mood lately, but wanting something that wasn’t going to be very heavy in calories (but still give me that warm comfort food feeling). This pasta completely hit the spot! 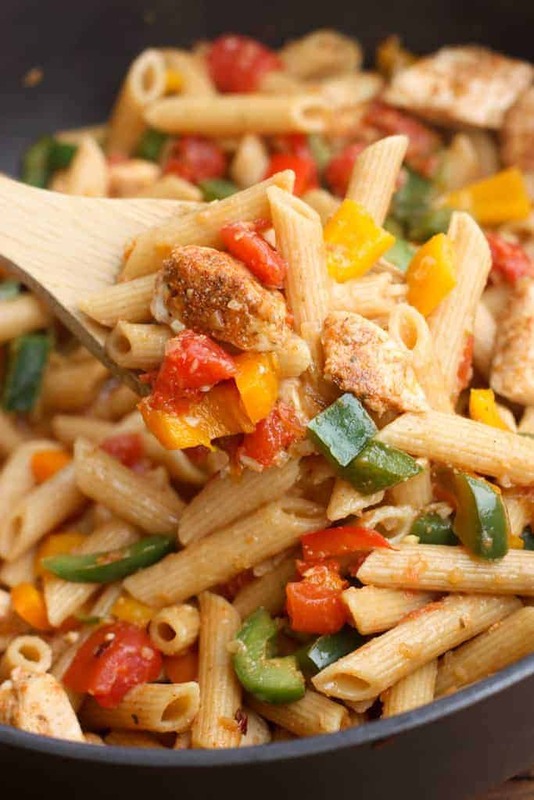 Fresh veggies and bold flavors from the easy homemade fajita seasoning combined with some whole wheat penne noodles. Completely family-friendy, easy and a fun twist to traditional tacos or fajitas. 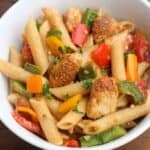 One Pan Chicken Fajita Pasta - everything you love about fajitas, transformed into a bold and delicious pasta dish! In a small bowl combine the fajita marinade ingredients. Place the chopped chicken in one large ziplock bag, and the veggies in another large ziplock bag. Pour half of the marinade into each bag and toss them to coat. Refrigerate for at least 15 minute or for up to 2-3 hours. When ready to cook, heat oil in a large skillet over high heat. Once hot, add the chicken (tossing any remaining marinade), cooking for 1-2 minutes before flipping to the other side. Cook for another minute or two, just until cooked through. Remove to a plate. Add the vegetables to the skillet (discard any remaining marinade), still on high heat. Add the minced garlic. Cook, for a few minutes, until veggies get slightly charred/blackened. Remove to the plate with the chicken. In the same skillet, add the broth, milk, diced tomatoes, uncooked pasta, and salt. Stir to combine and bring to a boil. Once boiling, cover, reduce heat to medium-low, and cook for 13-15 minutes or until pasta is tender and liquid is mostly absorbed. Add the chicken and veggies back into the skillet and stir to combine until heated through. Serve immediately, topped with salsa and sour cream, if desired. I made this for family and friends last night and it tasted so fresh and delicious! Just like fajitas! I was wondering if the marinade could be mixed up ahead and stored in the fridge overnight in order to reduce prep time on busy nights? Hi Michelle, thanks for your comment–I’m so happy you liked them! Yes, the marinade could absolutely be made ahead of time! I Fred, the milk is just to make it a little creamier. You could try soy milk or almond milk. When you say “tossing any remaining marinade” do you mean tossing it into the skillet or in the trash? Sorry if that was confusing–yes, discard the remaining marinade.